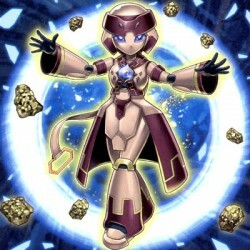 Pendulum Effect:- Once per turn, if a Normal Monster you control destroys an opponent's monster by battle, after damage calculation: You can add 1 Level 4 or higher Normal Monster from your Deck to y..
Pendulum Effect:- When a Pendulum Monster you control is destroyed by battle: You can Special Summon this card from your Pendulum Zone. Monster Effect:- Once per turn, if a Pendulum Monster you contro..
Pendulum Effect:- Once per turn: You can target 1 face-up monster you control; it gains 300 ATK for each "Performapal" card you currently control, until the end of this turn. Monster Effect- If this c..
Pendulum Effect:- Once per turn: You can Fusion Summon 1 Fusion Monster from your Extra Deck, using monsters you control as Fusion Materials. Monster Effect:- You can Tribute this card; add 1 "Polymer..
You can Tribute this card; Special Summon 1 "Superheavy Samurai" monster from your hand. During either player's turn, when a card or effect is activated that targets a "Superheavy Samurai" monster you..
You can target 1 "Superheavy Samurai" monster you control; equip this monster from your hand or your side of the field to that target. If it attacks a Defense Position monster, inflict piercing battle..
You can target 1 "Superheavy Samurai" monster you control; equip this monster from your hand or your side of the field to that target. Each turn, the first time the monster equipped with this card by .. Cannot be Normal Summoned/Set. Must be Special Summoned (from your hand) by banishing 1 "Infernoid" monster from your hand or Graveyard, while the total Levels and Ranks of all Effect Monsters you con..